Think you're king of the keyboard? Notch has a challenge for you. I've got good news and bad news. The bad news is that Notch's entry to the triannual Ludum Dare 48-hour game jam fell through, so we won't get to see what the blocksmith behind Minecraft could do in a weekend with the theme of "minimalism." The good news is that Notch went ahead and made a quick game anyway, launching it as a consolation game after a weekend of development. 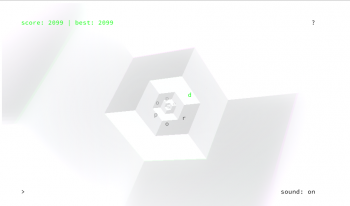 The result of his efforts is a challenging little keyboard-killer called Drop, which you can play in your browser right now if you've got a minute to spare. Drop tasks you with typing a series of words, though that's much easier said than done. Letters spiral out of a never-ending vortex of twisting shapes, which means it can be a challenge just figuring out what the next character is. There is a logic behind it - the letters form words from a very small dictionary - but keeping track of where one word ends and the next begins can tax your brain just enough to trip you up. Every incorrect letter speeds things up, and the twisting chain of letters gets more and more chaotic as the game goes on. Let one errant letter slip off the screen, and it's game over. Notch says he was inspired by the unforgiving Super Hexagon, the ending of Fez, and the interesting architecture of his apartment ceiling. The end result is somewhat mind-bending, and you probably shouldn't spending too long looking at it if you don't want a headache. Complementing the action is a pulsing soundtrack, which seems to be the primary reason that Notch didn't submit Drop to Ludum Dare - the music wasn't created within the competition's 48-hour time limit, and Notch admitted that he wasn't able to get around to composing a new song over the weekend. If you think your typing skills are up to snuff, you can give Drop a try right here, right now. It's no Typing of the Dead, but if you want to work on your words-per-minute, it's definitely more fun than keyboard exercises.